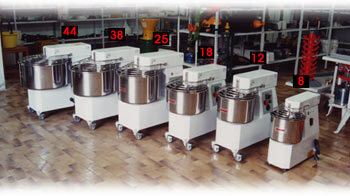 The spiral mixers represent the ideal for pizza-restaurants, confectioners, bakeries and domestic use. Strong high quality materials have been used fo its design. The particular shape of the spiral allows to get doughes perfectly mixed in a few minutes. The frame made in thick stainless steel avoids noisy sound vibrations during the machines' working stages.The steel-bowl, the spiral, the central shaft and the protection cover all made in stainless steel. The chain drive system is particularly silent being all in rotating parts assembled on sealed ball-bearings. For the reduction set has been used a geared motor. The electric system, made using only low voltage controls, conforms to the regulations in force. The machines are provided with the safety devices required by the anti-accident norms. Every kind of machine from 12 to 44 kilogrammes, will be supplied complete with wheels. As for the painting, only not-toxic powders suitable for food were utilized. All the machines included in our standard range work with single-phase motors. On demand are also available with three-phase motor, three-phase motor 2 speeds, special voltage motors ,timer. The kneading machine are available with : fixed head and fixed steel bowl in the range from 5 to 44 kilogrammes; available with liftable head (lifting-power made by means of a gas-spring) and removable steel-bowl (which may be disassembled), in the range from 12 to 44 kilogrammes. guarantee All these machines are guaranteed for 2 years against any defect in design.